I've had the privilege of interviewing some great subjects in the past: Sean Velasco of Yacht Club Games (Shovel Knight), Manfred Linzner of Shin'en Multimedia (FAST Racing NEO), and most recently, Big John Games (Cube Creator 3D). However, this interview subject is more personal to me as part of the St. Louis game development community. Happy Badger Studio is stationed right here in St. Louis, and I've known most of the crew there for a couple of years now. 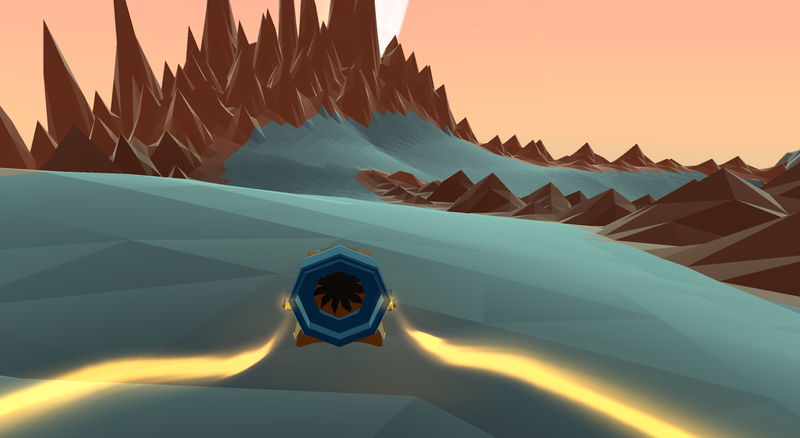 It excites me that they're entering console development with their work on the upcoming PlayStation 4 downloadable title SmuggleCraft, an atypical racing game featuring players piloting hovercrafts through procedurally generated courses. See the details of this upcoming PS4 release with my interview with them below. Phil Stortzum (PS): Just to bring everyone up to speed, would you tell everyone about Happy Badger Studio, how long you've been a team, past games, and the origins of your studio? Happy Badger (HB): Happy Badger Studio has been making games since 2011, including mobile titles like Stodgy Gents, The Flip. Cosmic Kitty Pop, and Strange Donuts vs. The World, among others. Long story short, we and several friends came together shortly after graduating from college, and decided to work together to make games. PS: In our first interview I asked if you were ever going to delve into console gaming. Now, several years later, SmuggleCraft is your console debut, and it’s looking promising. What made you decide now was the time to try your hand at console game development? HB: It felt like the right time for us to experiment with console game development. We wanted to create something that felt more substantial than a two-minute mobile game, and PC and console seemed like the obvious choice. Once we saw the PlayStation presentation at IndieCade, we were convinced that Sony would be the right platform for us moving forward. PS: Where did the inspiration to make SmuggleCraft come from? Where did the ideas about the mechanics, narrative, and structure originate? HB: The idea came out of wanting to question what's typically expected of a racing game, and make something totally unique. We were tired of games that ask you to constantly race around in circles, so our first goal of the prototype was to make a game that was fun to play and had randomly-generated tracks to keep players from memorizing circuit tracks. PS: When did development for SmuggleCraft begin? What did you work on first for the game? HB: We started in October of 2014. In the beginning, it was just one or two of us working on it a few hours a week. We spent most of our time in the beginning focusing on controls and the feel of the hovercraft. We knew that it had to feel just right, so we spent a lot of time getting it exactly where we wanted it. It wasn’t until later on that we started adding in better graphics, effects, and additional mechanics. 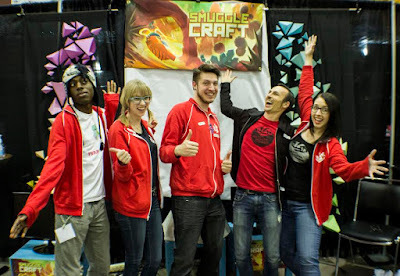 PS: When is development set to end for SmuggleCraft, and when is the game planned to be released? HB: We’re aiming to release early 2016. There’s a lot of work left to be done! PS: Do you worry that the name of SmuggleCraft might lead people to believe your game is related in gameplay style to Minecraft and games of its ilk? HB: Some people don’t like the name. I guess they think ‘craft’ is overused. It’s a bit polarizing, and we think that’s okay. In the end, it’s a hovercraft game that’s about the skill (or craft) of smuggling, and it also includes craft-able vehicle parts. It seemed too perfect. PS: SmuggleCraft features procedurally generated courses to speed one’s hovercraft on. How does they work and how hard was it to make it so randomized courses didn’t look or play off-kilter or totally messes? HB: The track is designed sort of like a puzzle-piece system. The track pieces have a variety of path sizes that connect to other pieces with the same size path. Each track piece is designed carefully with a specific experience in mind, but which pieces will ultimately connect together is randomized. PS: Not only are the courses procedurally generated, but if I recall correctly, so are the hovercrafts presently. Do you plan to offer hovercraft customization? HB: Hovercrafts will be customizable. The hovercrafts in the multiplayer demo right now are random to visualize the variety in crafts that there can be, but ultimately players will be able to use their own custom vehicles using modular ship parts. 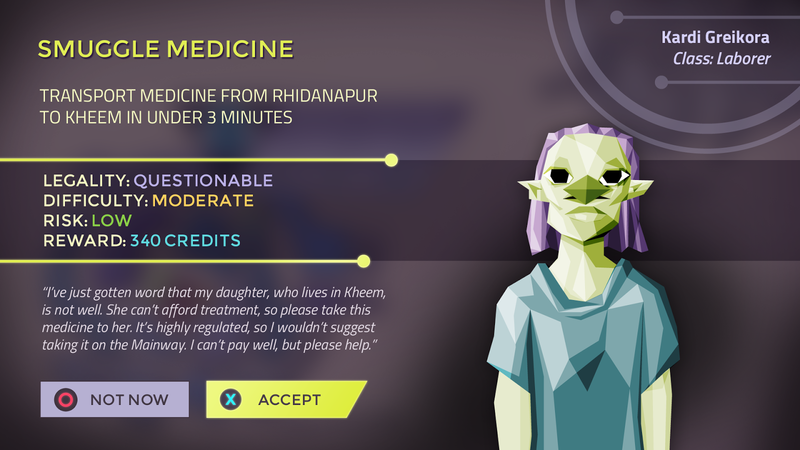 PS: What does the single-player portion of SmuggleCraft currently offer, and what else do you plan on adding to it? How much variety will there be apart from maneuvering one’s hovercraft from the start of a given course to the finish? HB: The single player campaign mode will offer a few different quest types for players to enjoy, and an overall narrative that they can play out and will change depending on the quests they take on and the way they play the game. PS: How is progress measured in SmuggleCraft? How are you going to keep SmuggleCraft in the minds of players for the long-term, so it’s not just played once and then never played again? HB: Our hope is that players will fall in love with the gameplay in the single player campaign mode, then continue to play as a social experience with the local and online multiplayer functionality. We've found within ourselves that the games that we play the longest and keep coming back to are the ones that give us a great social experience. PS: When I played SmuggleCraft at your studio, I accumulated credits as I completed racing events. What are they going to be used for? HB: Credits will primarily be used for the crafting system. Players will be able to use what they collect to make ship parts and upgrade their ships to suit their specific driving preferences. PS: What are you planning on offering for multiplayer? Will there be local as well as online play, and if so, for how many players? What is your biggest ambition towards multiplayer in SmuggleCraft? HB: We do plan to offer both local and online. We’d love to be able to offer eight or more players simultaneously online, but we still have a lot of work to do for that, so we’ll see what we can do! 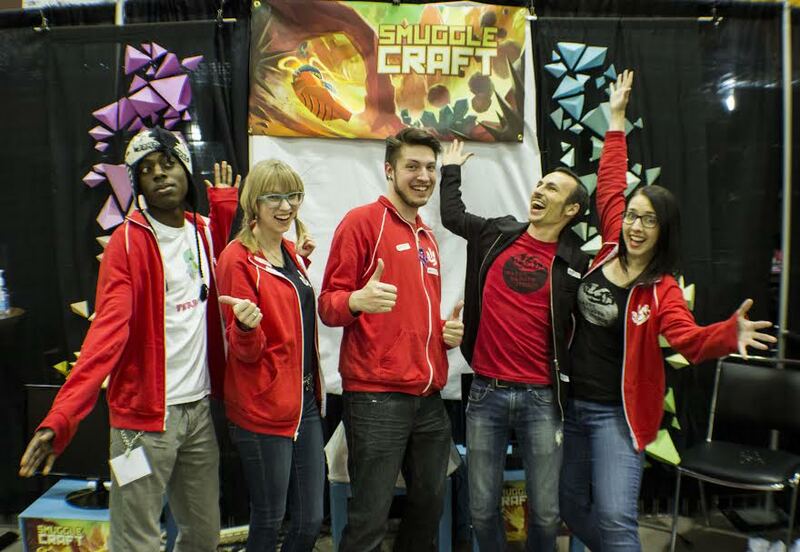 PS: What is each member doing as part of SmuggleCraft’s development? PS: You’ve been collaborating with Sony for SmuggleCraft with them giving you access to a PlayStation 4 development kit. How was the process to become a PS4 developer? Has Sony been kind and complementary to your studio? HB: Sony has been very helpful and supportive throughout the process. We are really grateful to be working on a title for the PlayStation 4. PS: Where do you see Happy Badger Studio in a year’s time? Five years? If I could be so bold, in ten years' time? HB: For all of those things: still making great games! My thanks to the Happy Badger Studio crew for their time and thoughtful responses through this insanely busy time for them. Stay tuned to SuperPhillip Central for even more interviews in the future of developers both big, small, and everything in between.